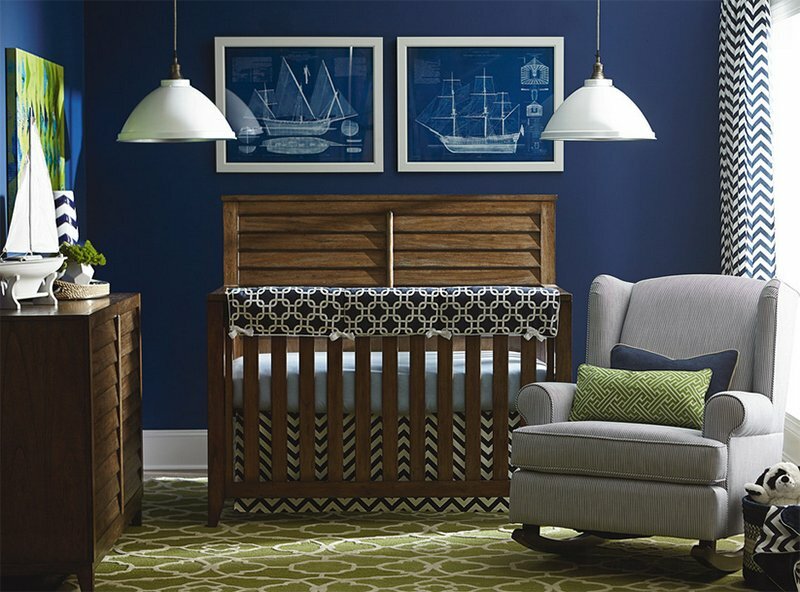 Design a nursery perfect for both baby girls and boys with the color blue. If there is one color that could be perfect for both boys and girls, that would be blue. Most of the time, it is associated with males or it is considered a boy color. But of course, that is not the case. Blue is a unisex color especially when used for the interior. Well, all colors can actually be used by both males and females of course. But then again, we are going to show you how this color can be used for a nursery that fits a baby boy or a baby girl. Some parents use this color especially if they are not yet certain of their child’s gender. 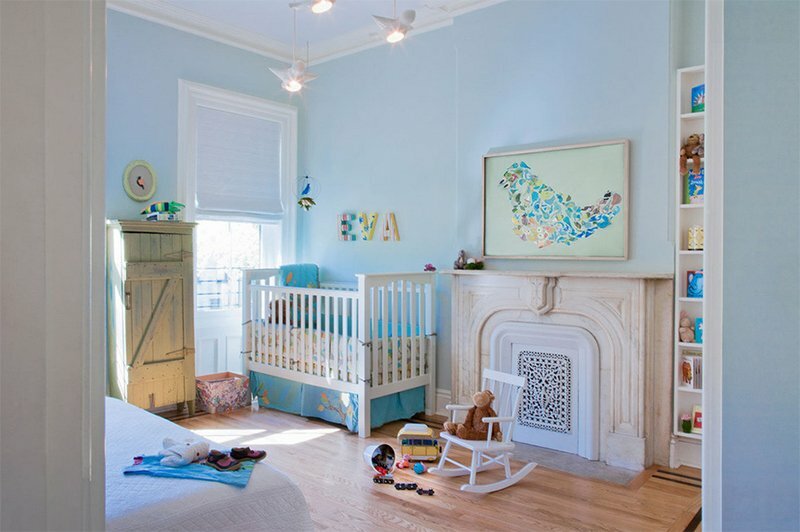 So, what we collated for your inspiration today are nursery rooms with the color blue. They come in various themes from a coastal room to a chic bedroom for a little girl. It can also have a prince them or a modern blue nursery. Yes, the possibilities of style and design are limitless. You can get more ideas from the photos of nursery interiors below. 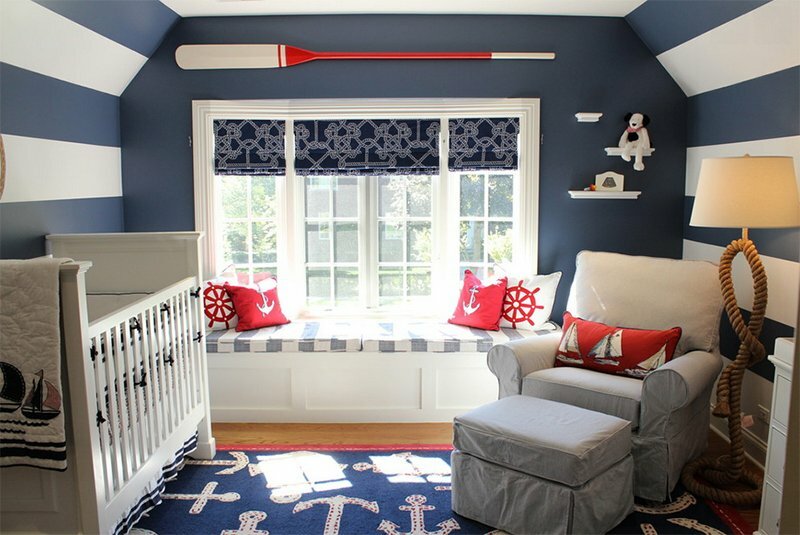 A coastal themed nursery complete with boat decors from the wall arts to the small boat on top of the cabinet. It is also nice that wood was used for the furniture here. The pattern combinations look great too. A modern mix with custom hand cut paper bird art on the wall. Notice other fun decors in the nursery too with a light blue wall. A modern bedroom use geometric shapes beautifully from the circles on the wall to the patterns on the area rug. 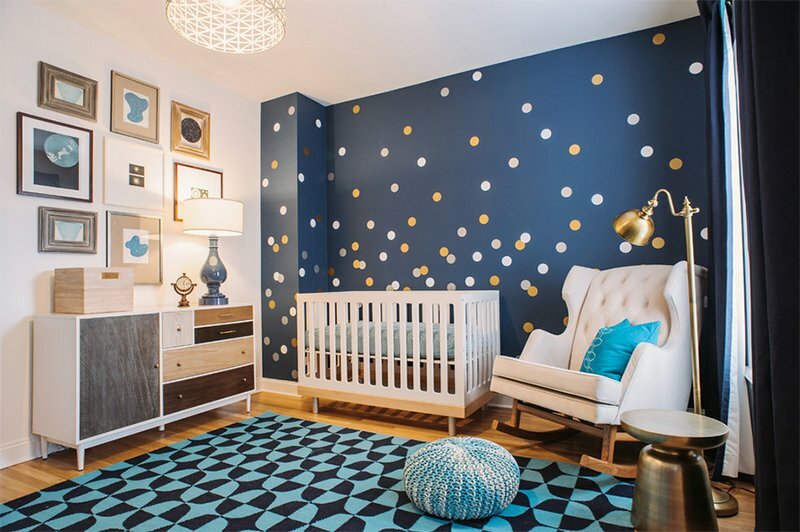 Aside from the animal decors, this one has a night sky ceiling which is a nice way to give this nursery a nighty-night feel. Another nursery with a coastal theme. Who wouldn’t like this, anyway? I am sure you’ll love that wheel on the floor as well as other cute details in the bedroom. J & J Design Group, LLC. A bright and sweet little nursery for a baby girl featuring fun Sparrow wallpaper as well as pops of yellow and mint green that make it feel happy and inviting. Mary Wyar Aside from blue, green is also added in this nursery like what we can see on the area rug. One part of the wall was painted blue. 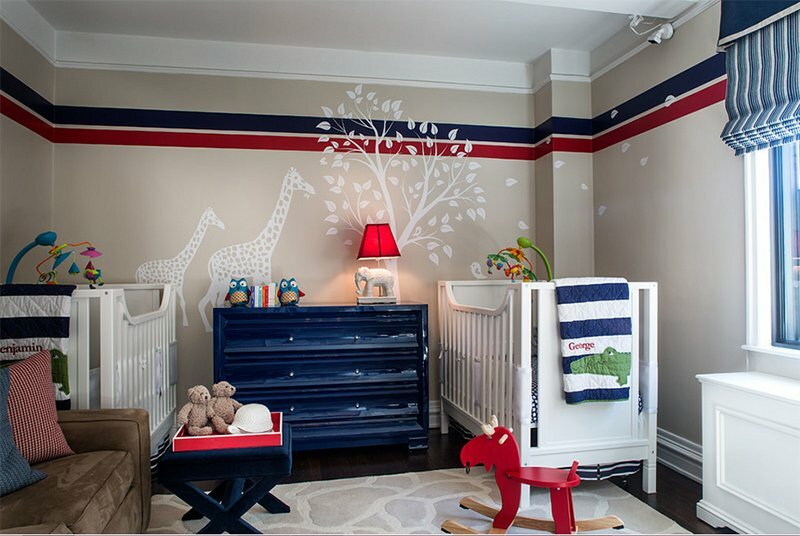 Steffanie Danby Interiors Nautical themed nursery with stripes on one wall and anchor prints on the area rug. 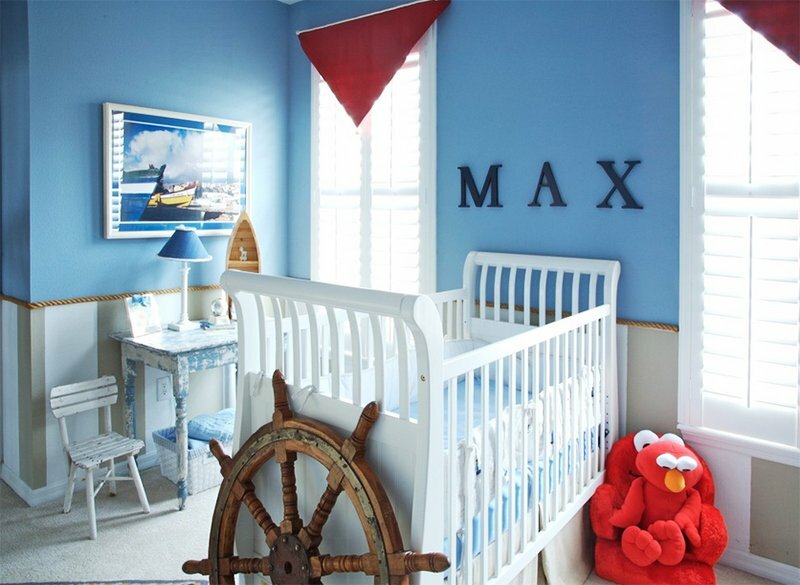 Like the combination of red and blue in this space for a baby boy. Signature Homes Of course, those owls are cute! Love that white and yellow striped ceiling and blue walls. Notice that cloud rug on the floor? So fluffy! Cuteness overload! Who wouldn’t love pink and blue for a nursery? It looks super cute especially with all the details added in here from the tree wall decal to the hampers. 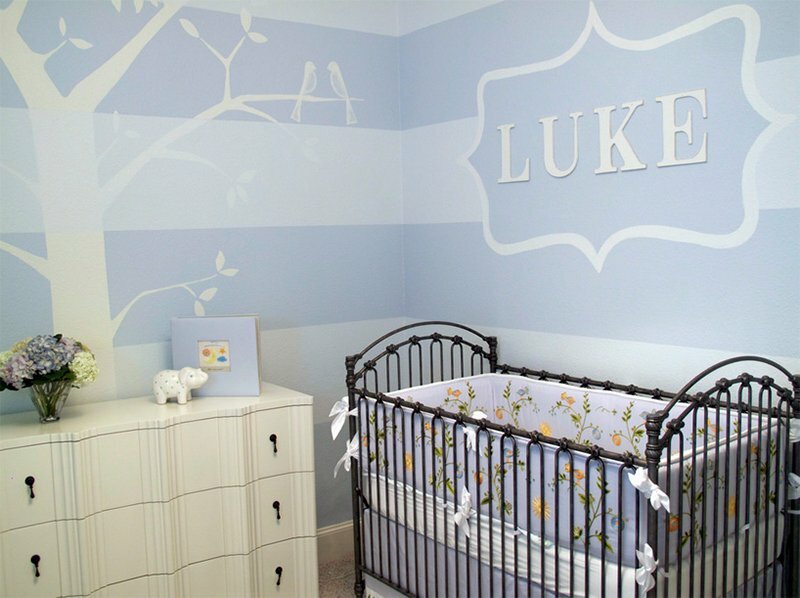 Another nursery room with a tree decal on the wall that were placed on top of striped blue and white walls. 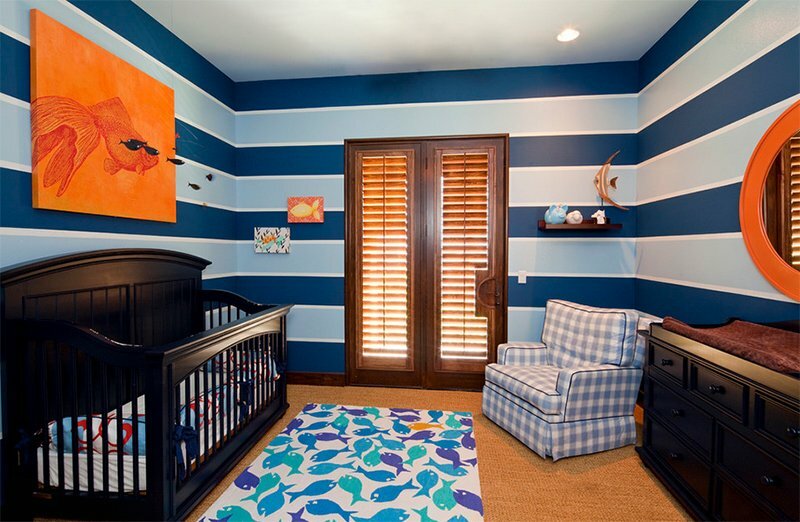 Same as the previous bedroom, this nursery also has stripes too. Pretty cute, right? 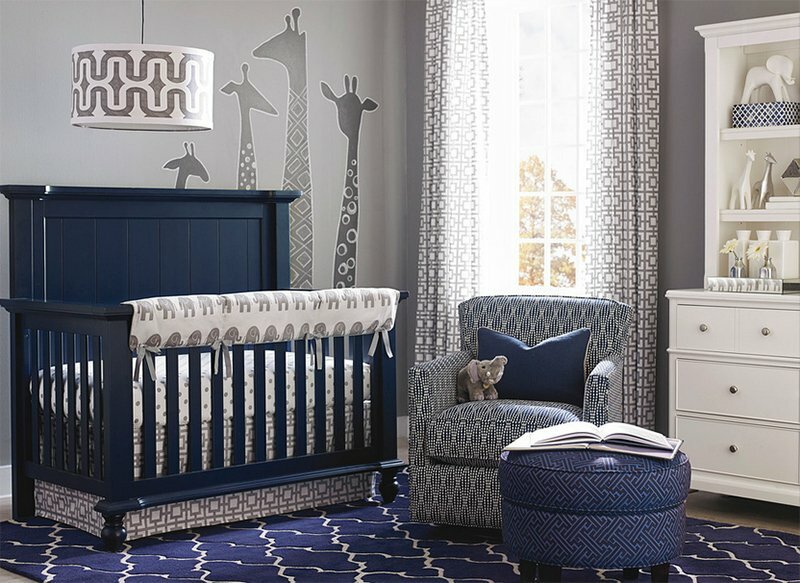 Cute pompoms were used to decorate this wooden crib that sits on a blue area rug with geometric prints. Blue and gray are combined for this bedroom. 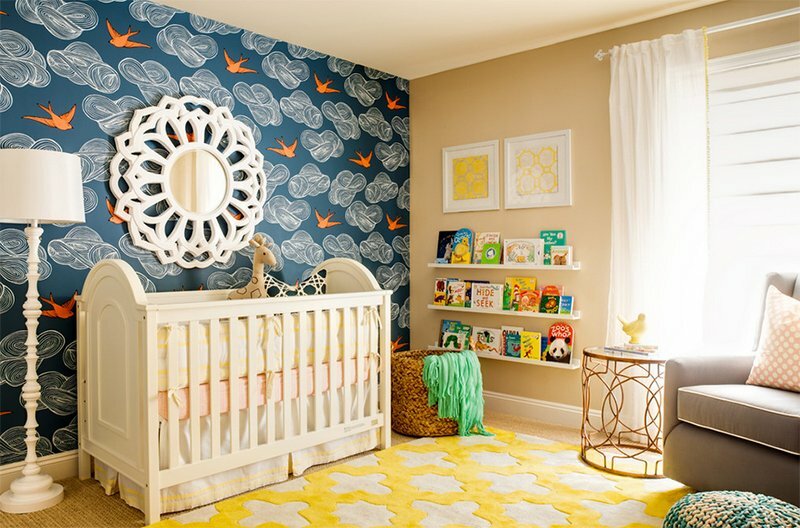 This nursery also shows us that patterns of different styles can actually look good together. 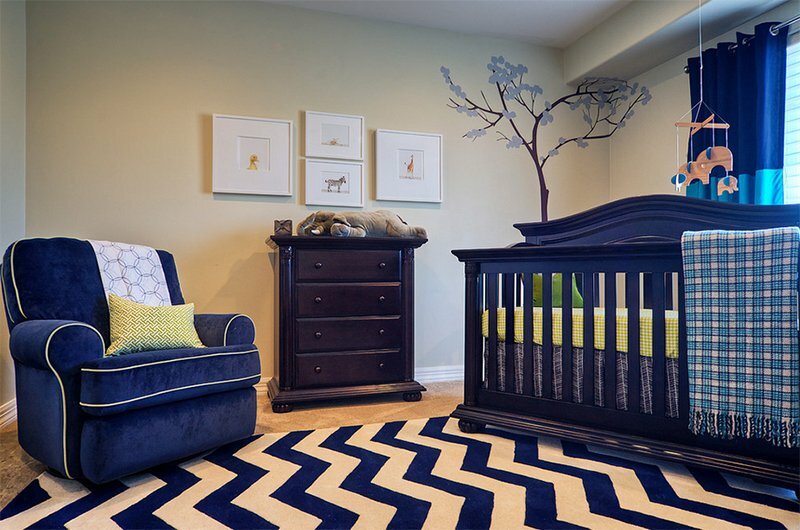 A traditional nursery with a chevron area rug, blue seat and a blue traditional crib too. Nice tree on the wall! Light blue and white is used for the chevron bedroom. But white is widely used especially for the crib and sheets. Blue and green is combined here from the wallpaper to the area rug. Nice colors indeed for a modern nursery. Cute fishes are the theme of this bedroom with blue hues for the stripes and the area rug. Look at that wall art, isn’t it very creative? 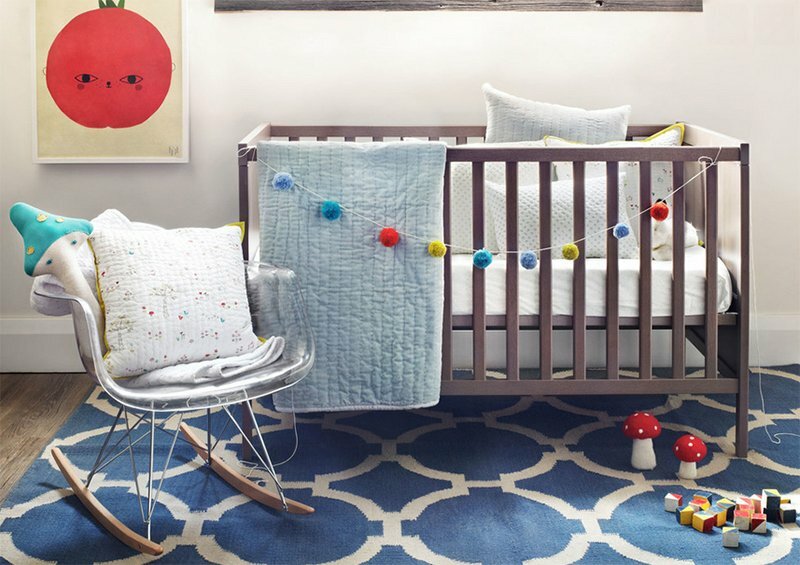 Aside from blue, red is also used for this nursery too. It gives a nautical feel but this has a jungle motif as what we can see from the decals. 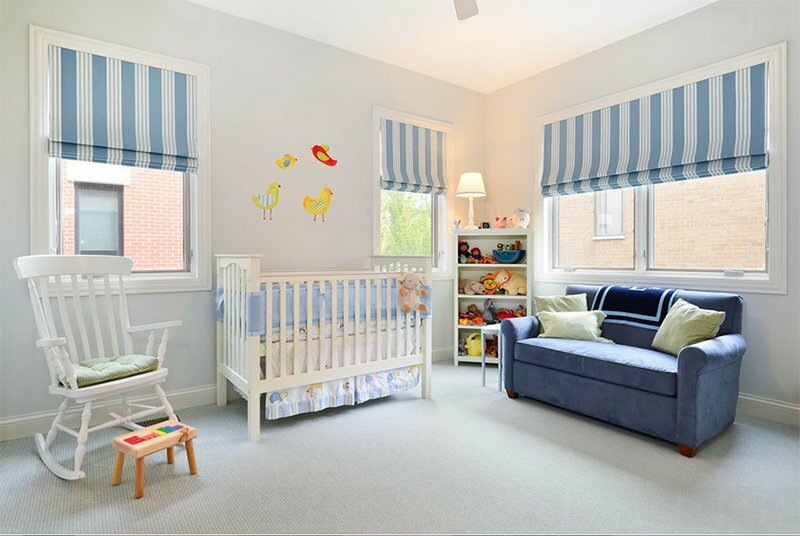 Light blue and stripes is the style of this nursery. This might be the kind of space you want for your little bundle of joy! Around the crib is a pretty canopy made from curtains. 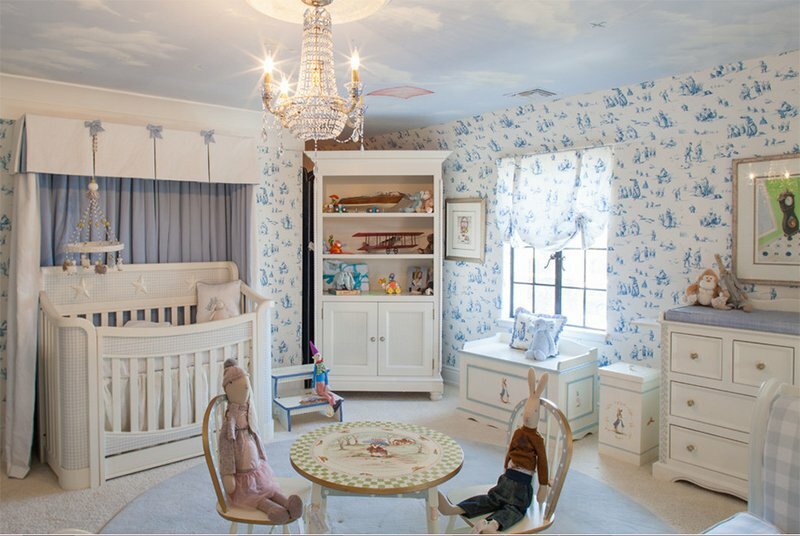 This whimsical nursery has a pretty blue print on the wallpapers. And look at that chandelier too! 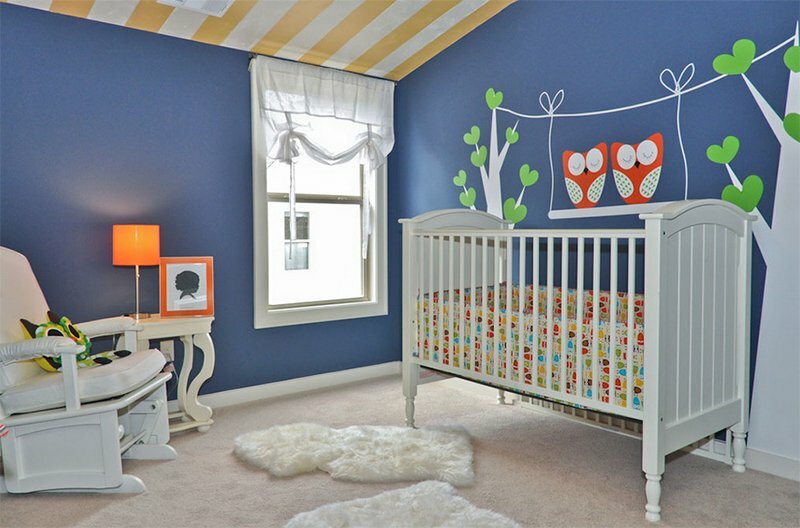 If the previous nursery is for a princess, this one is for a prince with silky blue and gold colors. 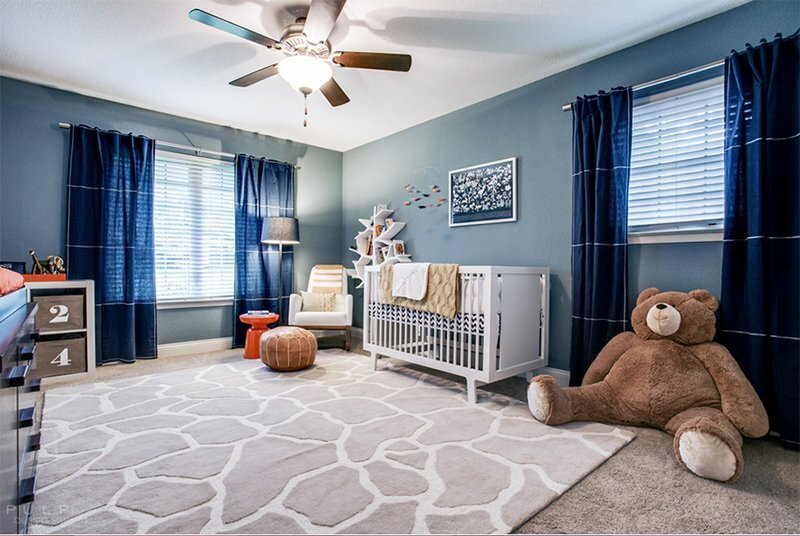 That cuddly brown bear is a cute addition to this nursery for a little boy. Notice blue curtains and decors too. 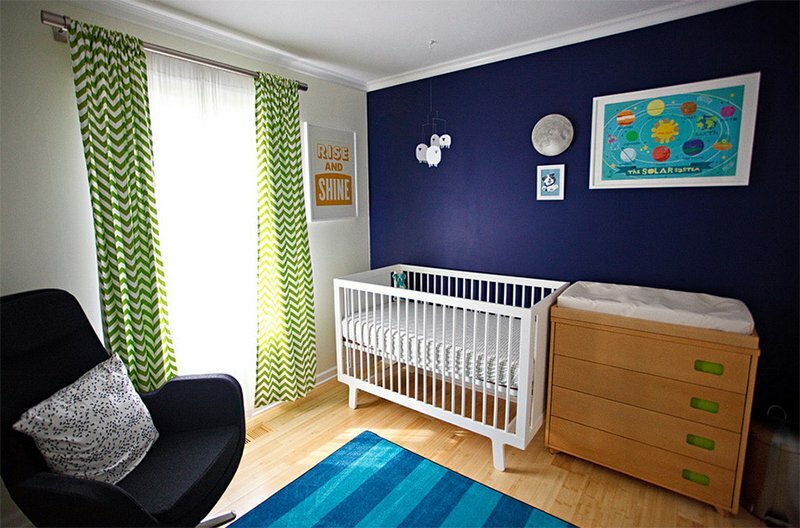 I’m sure that you were able to get a lot of ideas for your child’s nursery with blue colors. As we have seen, you don’t need to overwhelm your space by everything blue. You can mix it with other colors too. You can also add furniture or decors and even fabrics with the color blue. Some would add wallpapers with blue prints or even an area rug with that color as well. You have seen all these on the images of above featuring nurseries with that motif. Can you tell me which of the above spaces you like the most?